This is such a rising trend today. More and more people are cutting the cable cord so they can ditch satellite TV. The cost of TV is one of those things that drives me crazy. I just cannot understand why these companies are able to get away with charging hundreds of dollars every month to hard working people. I mean what on earth are all these commercials for anyhow? Someone is getting rich somewhere and it sure isn’t me. One day while doing my annual Financial Spring Cleaning, I took a good hard look at where our money was going. When we first got our TV package we had some promo for $29 a month. Now several years later I was shocked to see we were paying $109 for a basic package! And the most annoying part of this??? Over 500 channels of nothing. And for this, I was paying over $1,200 a year?? Not to mention the NFL package at a whopping $300. That was a grand total of $1,500 a year for TV. Yep, it was time to make a drastic change. For a few years, we had been putting our TV on “vacation” mode for 6 months. Although at first, this was hard, we actually began to look forward to it each spring. Not having that lure of junk on TV to call us away from outside really was a blessing. We got more done, spent more time talking, and enjoyed the outdoors much more than we used too. Knowing we could go without TV for 6 months made the decision to ditch satellite TV good that much easier. Surprisingly the kids could have cared less. I guess I was the one with the hangup…who knew! So what do we watch now? 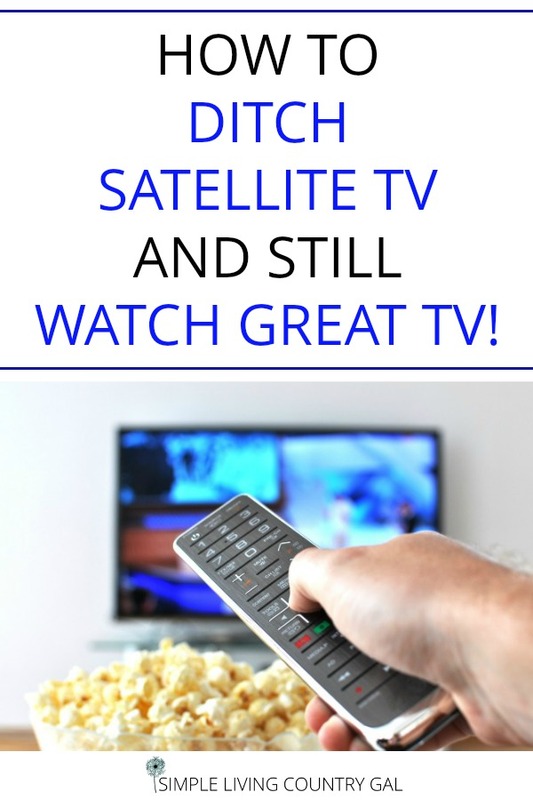 How to ditch satellite TV and still watch great TV! We have our local channels, so regular TV and news not to mention PBS now get a lot more of our attention. I do have to say I was pleasantly surprised at the quality of the shows that are on regular TV. I think we are able to get 16 channels for absolutely free. This includes PBS’s Create which is great for the DIY in me not to mention lots of cooking shows. I just love myself a good cooking show. How can you get your local channels? Well, if you have a TV that is newer than 2007 if will have a digital tuner. If you have a TV that is older, then you will need to purchase a Digital Converter Box. I have not purchased one of these in years and things have totally changed. Please use this link as a starting point and do your research to ensure you get the right product. If you aren’t sure, just go to your TV’s website and look up the make and model to find out. For many people, this may be enough, but I soon discovered I am a TV junkie and need just a bit more. Let’s step it up a bit! To get a nice movie selection we subscribe to Netflix. They have a very affordable streaming package at just $8 a month. However, before you do this you will need to make sure you have a sufficient internet connection with a large or unlimited data package. I believe it takes about a gig to stream a movie, so if you have a cap of 10 GB a month this may not be for you. If you are unable to stream, Netflix offers a DVD rental program through the mail. We did this for a few years and really liked it as well. Not sure? Netflix has a free offer to try it out first! Another really affordable option is Hulu. Hulu offers a nice selection of movies along with network television shows. 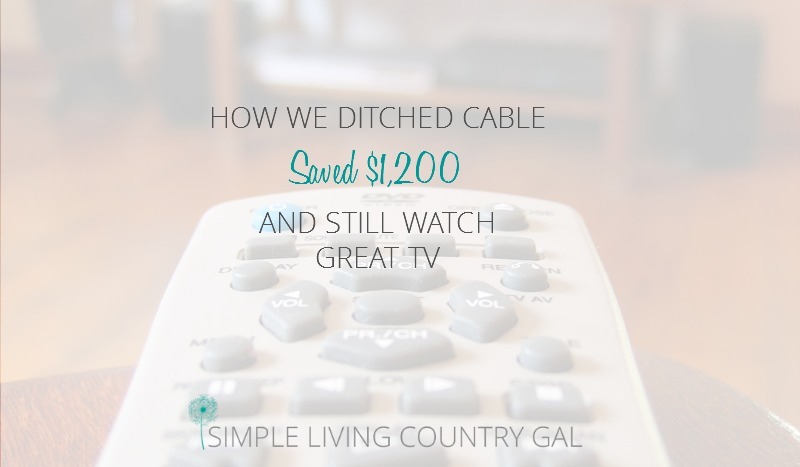 The biggest adjustment when ditching our satellite TV was losing our DVR. Hulu helps solve that offering a large selection of newer shows. If I miss my favorite show on TV, I can usually catch them later on Hulu. Another option is Amazon Prime. For an annual fee of $99 (monthly payments are also available), you get unlimited streaming of movies and TV shows. Another perk is free priority shipping on thousands of items, plus free photo storage, music, books, and more. This is a great alternative to Netflix and Hulu if you want to save even more money. Ninja tip! Not sure if Amazon Prime is right for you? How about a 30-day free test drive? Yep! You can try out Amazon for 30 days for FREE. Remember to put a reminder on your phone so you don’t forget to cancel if you decide it’s not for you. Finally, every fall we purchase a few months of Sling (live TV) to get ESPN so we can catch Monday Night football games. At $24 a month, this one is a bit more expensive, but it is still cheaper than going to a restaurant or sports bar to catch the game. 🙂 Trust me, we did the legwork. Along with ESPN, you will also get HGTV, the Food Network, Disney, and AMC just to name a few of the more popular channels. Ninja tip: Please be careful with Sling. I find a lot of lag when I stream and that can be quite frustrating at times. I have contacted them and they ensure me it is an issue on my end only and has no other help to offer me. For that reason, I am only a partial fan. However, the sports have never lagged so that goodness for that! So, how do we get all these channels? Our boys purchased a ROKU for $50 for Handy Man Hubby a few years back. Roku is a streaming device that allows you to get the packages above. They also offer more TV that is free and some others such as HBO that you need to purchase monthly. The best part is Roku is not a subscription. Once you purchase it you own it forever. Nice! Okay, great…so what is our savings? Netflix monthly subscription $8 a month. Hulu monthly subscription $8 a month. Sling monthly subscription $20 a month for 5 months only. Annual cost is including the purchase of Roku is $342 the first year, each year after will only be $292. This is an annual savings of ………….. Please know that if your TV and Internet is bundled this may not work for you. You may still be able to call and negotiate a discount. 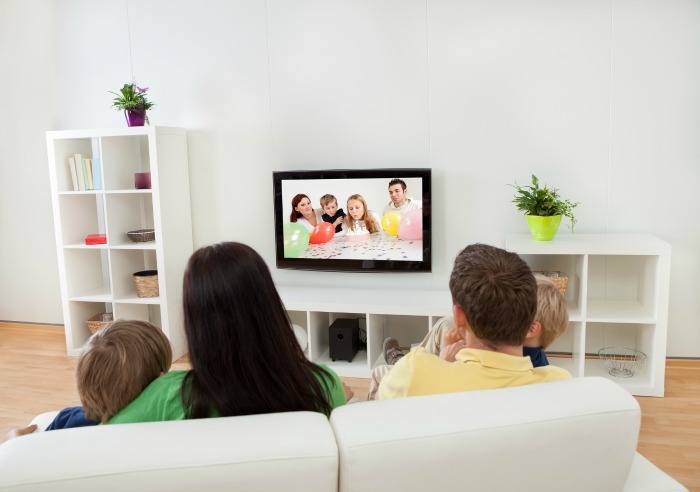 Ninja ways to ditch satellite TV and save big! Tip #1 Hit those yard sales baby! I cannot even tell you how many movies I have purchased for next to nothing at yard sales. My eclectic collection spans from Singing in the Rain to Jaws. There really is no rhyme or reason to what I will buy and my family is always so excited to see what I will bring home next. Tip #2 Make a stop at your local library! Did you know most libraries not only rent out movies for next to nothing but also have a pretty large collection of FREE rentals? Not only that but rentals are for a week rather than just days. Tip #3 Call in your friends and family! I am sure you are not the only one that has a large collection of DVD and VHS. Reach out and see if your family or friends would be willing to set up a weekly swap of sorts. Before you do this, however, I would stick a return address label on each movie so what you lend out has a better chance of coming back to you. So peeps, let me break it down for you into some easy-peasy steps. Ditch Satellite TV in 8 Easy Steps. Step #1 Practice by putting your service on vacation mode. Call your company to see if this is a free option. While you are on the phone make sure you are not under contract. Try it for a month to find out if you can live without expensive TV and not go crazy! If you survive please proceed to step two. Step #3 Cancel your expensive TV! If you are under contract you may have to pay a cancellation fee, read that fine print to make sure. Return all equipment as advised. You are not saving money if you have to pay for non-returned equipment. Then you are done! 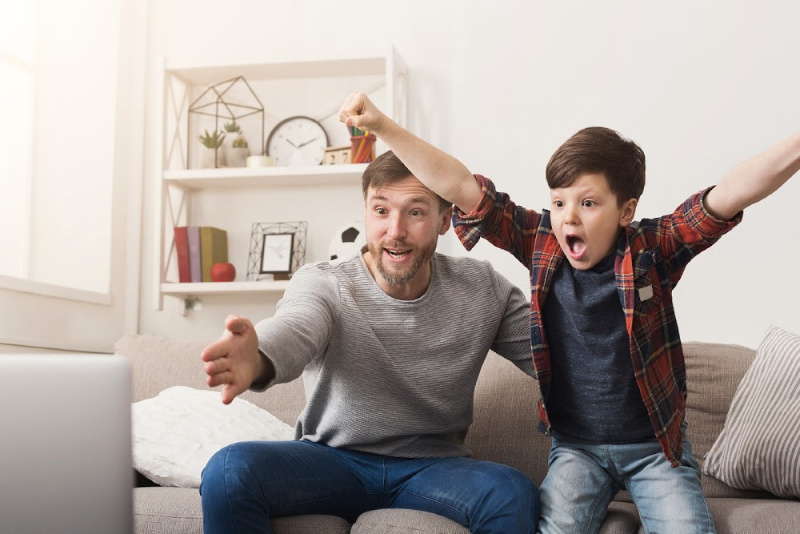 Get your movie fix by renting free movies at your library! You can also stock up on dirt cheap movies at yard sales and do a swap with your friends. Are you a bit of a TV junkie and need more? Keep reading! Step #5 Purchase a ROKU or other streaming device for your TV. Make sure your internet is fast enough to stream movies and you are NOT on a limited data plan. Step #6 Purchase a TV package to stream from. Common ones such as Netflix, Hulu or Amazon are a great solution for the movie buff. For just $9(or less) a month you can get your movie fix. Read above for a rundown of each. Step #7 Finally, if you are a sports junkie, invest in Sling to get ESPN. You can also stream your sports through your computer, but we did not like this option. Because you are officially saving a nice chunk of change! And that’s it! For years we paid a fortune for TV not knowing there was another option. When we first cut the chord our friends were a bit surprised, they just couldn’t understand how we survived without TV. Now we are happy to say we are not alone. 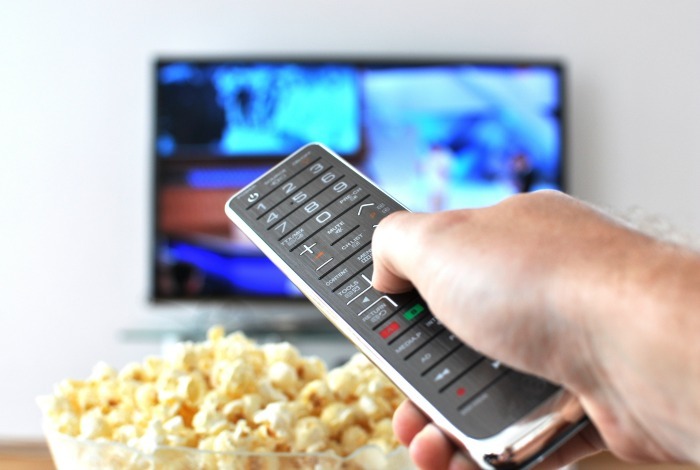 Have you learned to ditch satellite tv and are saving big? Leave a comment below, I would love to hear from you! Looking for more money saving ideas? Check out my post on Spring Clean your Finances and Give yourself a Financial Turnaround. Oh I pay a pretty hefty amount for our internet I’m afraid, but that is not something we are willing to give up. It’s all about choices and what you are willing to let go of in order to keep something else. 🙂 In our case cable/satellite TV needed to go, and we are the better for it! Our cable is so expensive and there are only two internet providers in this area. I think we have a data cap too. Do you get your local channels? Have you heard about the tv key that they have now, I wonder if it works? yes, if you have a cap on your internet streaming may not be an option. However, we have been putting our TV on vacation mode for half the year before we were able to stream. We used an analog box to get our local channels and rented free movies from the library. We also used Netflix and their DVD mail membership which is very reasonable and their movie selection is larger than the online selection. I have not heard of the TV key, I will have to look into that. Thanks so much for sharing and good luck! It just frustrates me how cable companies get away with charging such insane amounts. I hope you are able to come up with a solution! I have Frontier for Internet and it is only $ 35. 00 a month. I have never heard of Mobdro, I will have to check that out. Thanks for sharing!! I just realized by the large response of internet questions that you all must get your internet bundled or at least through your TV provider? In that case, I do see how this post would not be of much help. I tell you what, I will do some research and see if I can come up with ways to save money on TV in your situation. I’m on the job! I have Comcast. I just iunbundled our service. You can get ultra high speed internet for less than $100/month. Ladies, look to your cell phone providers for unlimited Wi-Fi. Use that for your internet. TIVO makes a “broadcast tv” version for around $50 and the service is $14.99 a month. It works great at recording several shows at once. This was a great compromise for us as we missed the ability to pause live tv or record our favorite shows like we had when we had DISH. It has an app as well so if you are away from home and want to set it to record a show, you can do that too. We haven’t missed our Satellite TV a bit and the savings is tremendous! that is a great tip, I need to look into that….thanks! Thanks so much for sharing this information! I broke down and got U-verse, mainly for HGTV and football. I’ve heard of Roku but didn’t really know what it was and have never heard of Sling. I will definitely be checking into it! I’m also glad I came across this, via Pinterest because I am going to start following your blog. I am so glad you are here. 🙂 I have not heard of U-verse, I am really excited to see what it’s all about. Your posts are always so timely! We *just* signed up for Netflix and assuming we can assimilate with it easily enough we will then drop cable. There will be a bunch of shows we would miss, but will look into Hulu (thanks for that idea!). I can hardly wait! What do you know about TV Scout?? i have searched everywhere, sometimes it looks legitimate & sometimes their website doesn’t exist? Anyone else? Since I am Canadian and would love to know: Hulu, Crave TV Amazon Prime(not available to Canada) or Netflix working well within Canadian system. I do not know about TV Scout, maybe someone else will chime in? I do know that Netflix has an option of DVD by mail. My son does this option and although it is not streaming, you do at least get unlimited movies (1 or 2 at a time) in the mail. This will give you something new to watch when antenna TV is lacking a bit. As far as working in Canada with their systems, I would call. That way you can ask exactly what you need to know and get specific answers. You can find all phone numbers under contact in most website footers. Hope that helps! Thank you for this post! I have been researching streaming tv & cutting DirecTV for when we move in a few weeks & have been making it more difficult than it is! Ha! This all makes sense though! Thanks again! I am so glad! I have a very bad habit of making things harder than they need to be sometimes so I am right there with you!